If you have heard it from us once, (or more!) it’s worth repeating! We love fall decorating! So if you missed Part One of this post, you might want to jump right on over and check out 18 Classy Fall Decorating DIY Projects Part One! But don’t forget to jump right back over here to check out the rest! So here we go with your next nine fall decorating projects! 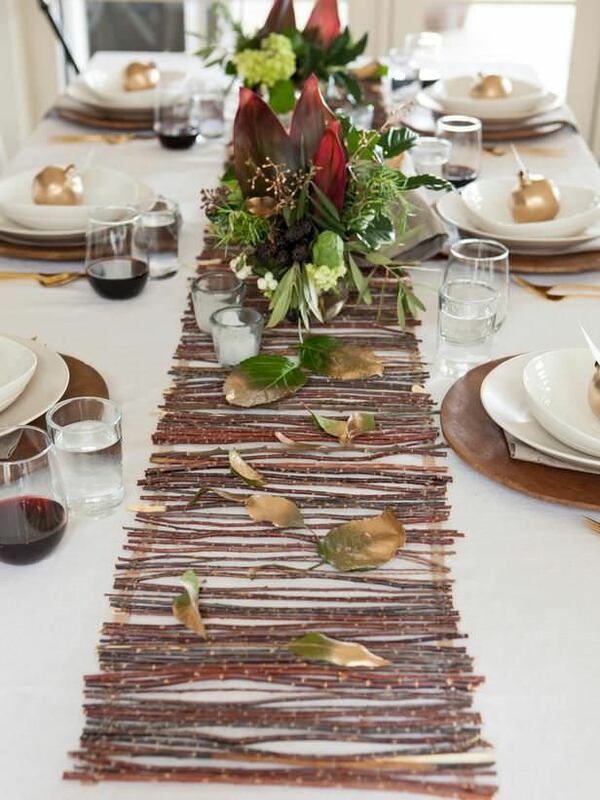 Make a rustic twig table runner with this tutorial by ‘HGTV‘. 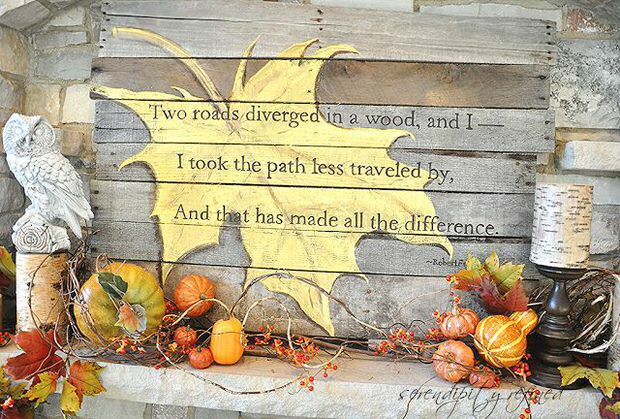 This is a really simple fall decorating DIY project, and I love working with natural materials. I want to make this!You could use this all season, but it would really add some natural “feels” for Thanksgiving as well! Love this burlap pillow from ‘The Opulent Cottage‘! She actually has the directions on how to make the burlap pillows on a different page than where this photo is. In case you don’t catch the link in her post above, here’s how to make burlap pillows. 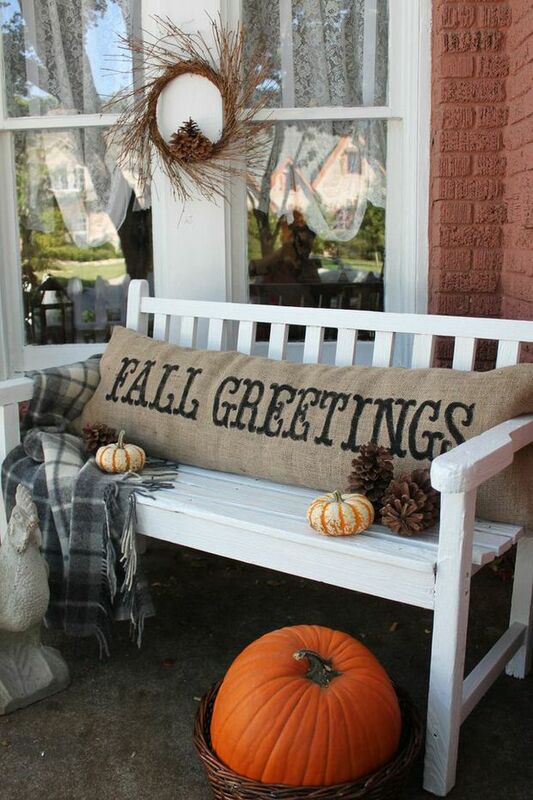 And don’t you just love the idea of putting a throw blanket out on your fall front porch? Don’t forget the cocoa! 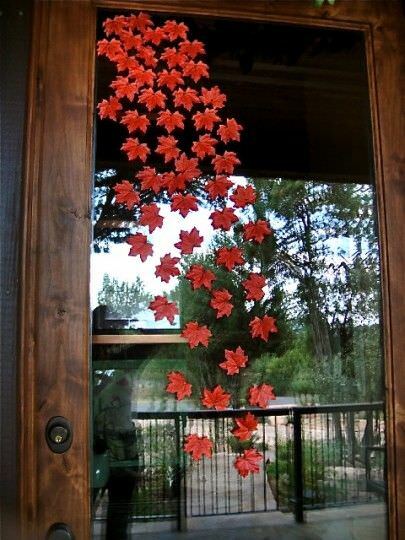 From ‘Country Design Style‘, these falling leaves are really clever! At first I thought…”Glue?” Then I realized she’s right, hot glue will just peel off glass later! Go ahead, go check it out. Genius hack for a quick trick to decorate for fall. 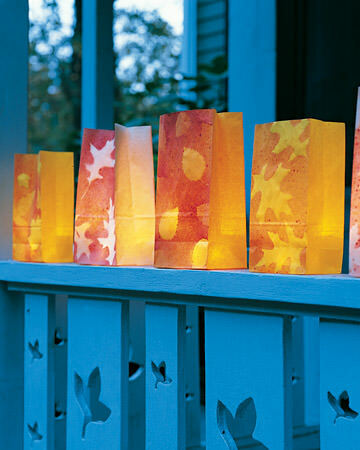 These autumn leaf luminaries are perfect for lighting the walkway or porch for a dinner or party. A fall decorating DIY perfect to do with the kids, from ‘Martha‘. If you are looking for something different than the usual fall wreath for the front door, (or anywhere else for that matter!) 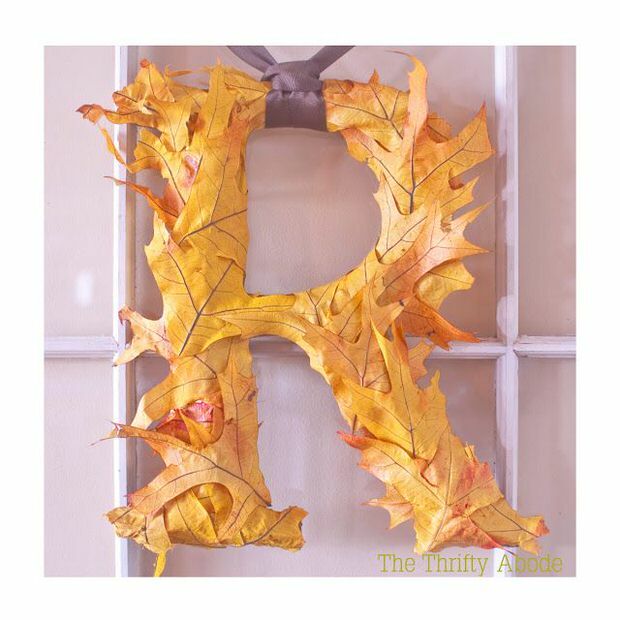 then try ‘The Thrift Abode‘s’ fall leaf initial. 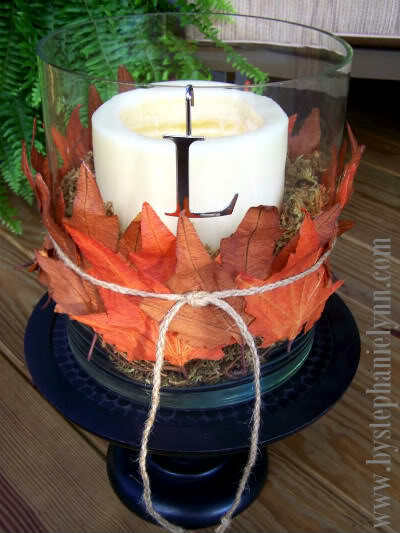 Easy and inexpensive, this is a fast fall decorating project. Good tutorial and she shows you exactly where she got the products she used to make this. Here’s another twig project for you… (don’t you just love having something creative to do with the yard clean up leftovers? 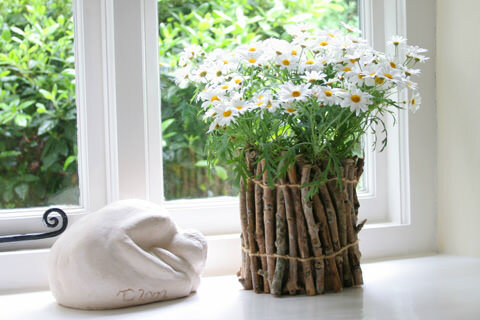 🙂 This twig flower pot by ‘Nini Makes‘ is cute, easy and a perfect place to pop a couple mums into the decor. Pretty! ‘Serendipity Refined‘ has a fall decorating DIY tutorial for this pallet fall sign that really makes you feel the spirit of autumn! 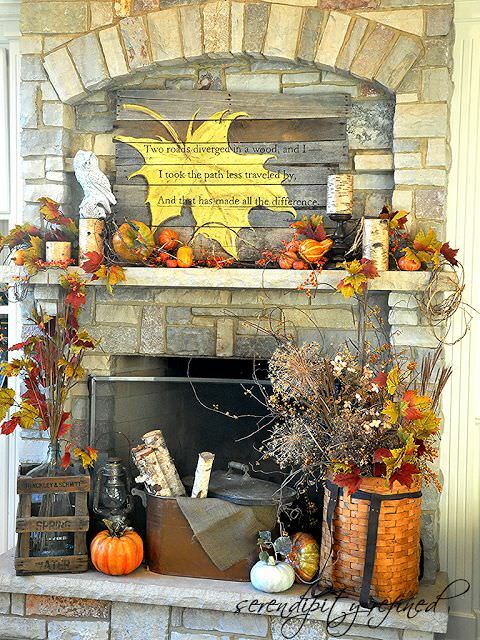 I’m also including a pic of her fall mantel as well. If you want to feel the season, take a few cues from her design sense! Beautiful! We can’t do a post on fall decorating without including a few candles! This Pottery Barn inspired fall hurricane by ‘Stephanie Lynn‘ is a money saving project that looks like she paid good money for it at… well, a place like Pottery Barn! Love the initial! 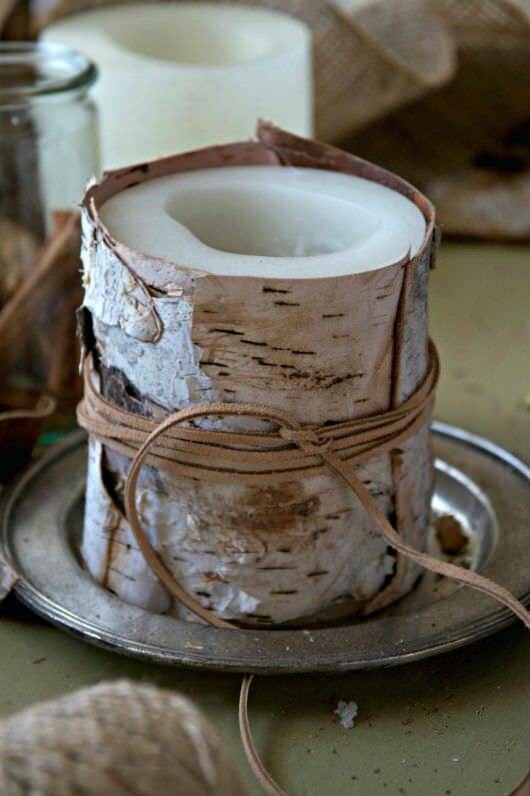 This birch bark candle by ‘Just a Smidgen‘ is a simpler style, very natural. Scroll down her page because not only does she have the instructions for this candle, she has several other candle ideas as well. Ok, well that’s your last nine in our 18 classy fall decorating DIY projects… but we couldn’t seem to stop, so I’m throwing in one more, just for inspiration. 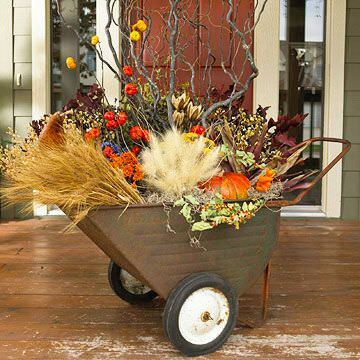 Gotta love ‘BHG‘ and their DIY fall decorating ideas! We hoped you loved Part One and Part Two of 18 Classy Fall Decorating DIY Projects! We think you will also love DIY Fall Wreaths and How to Reupholster Almost Anything! Thanks so much for featuring my Fall Greetings pillow, Kathy! It’s such a simple project, with so much impact, I hope everyone gives it a try! Thx for such a great project Andrea! Love your blog as well! Thanks for sharing it Jeanette! It was such a cool idea, and thanks for sharing that the glue came off easily, Im sure a lot of people will be more willing to try it after hearing that!